According to an industry report, the global catalyst market is expected to eclipse $34 B by 2024. 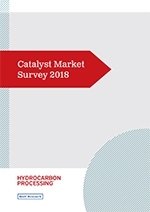 To maintain and expand market share amid strong competition in developed countries, catalyst manufacturers invest significant time and resources in the development of better catalysts with performance at higher temperatures and pressures, lower costs via increased crude oil feed rate or longer catalyst life, and higher-quality end products. These factors will help sustain growth in mature markets.